Theater Manager Brooke Lowe demonstrated the digital projection facility, including the premium, large-format auditorium theatrical facility, The Cube. Students were shown examples of the previous 35-millimeter projection process and the newer, all-digital format theaters now show. The Cube includes a 51-speaker, eight-subwoofer systems that features Dolby Atmos technology. "The speakers are designed to give a full, three-dimensional sound throughout the theater, so when someone on screen has someone behind them, it literally sounds like it's behind you in the theater," Lowe explained. The projector is equipped to screen films at a high frame rate (HFR) than the average 24 frames per second of most films. Higher frame rates means less blurring of images and sharper image clarity. 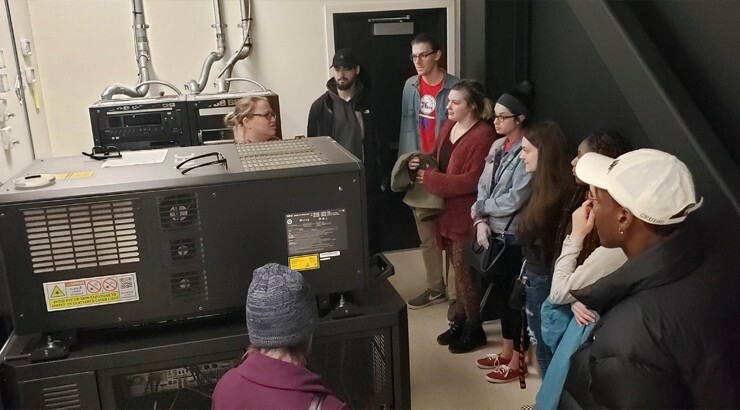 Following the tour of the projection booth, students were able to experience the nuances of the facility first-hand with a screening of "Captain Marvel." Immediately after the screening, Lowe led the students behind the 58-foot-by-24-foot screen. "It was interesting seeing the size difference for screening films in traditional format and then seeing them formatted for The Cube," student Jack Kyrtsis said. "I really enjoyed the experience," student Savannah Swanson said. "I didn't realize just how much prep went into screening a film in the theater, so I have a new appreciation for that." "Many students in the program are studying and creating films of their own, so giving them the opportunity to view the entire process in person is much more enticing than reading about it in a textbook," Department Chair Rob Rector said. Top: Delaware Tech communications students recently visit The Cube at Movies at Midway in Lewes. From left, Camryn Schatzman, Olivia Tennefoss, Jana Ruark, Chris Parker, Savannah Swanson, Jim Roblero, Lauren Moon, Jack Kyritsis, and Howard Mumford listen to Atlantic Theaters Manager Brooke Lowe explain the projection process. Bottom: Atlantic Theaters Manager Brooke Lowe explains the projection process in The Cube large-format to students, from left, Chris Parker, Jack Kyritsis, Olivia Tennefoss, Savannah Swanson, Jana Ruark, Lauren Moon, Camryn Schatzman, and Howard Mumford.